Perform the following actions to unlock additional gameplay modes. Poker Mode - Attain Level 5 in Classic Mode. Butterflies - Attain Level 5 in Zen Mode. Diamond Mine - Unlock the first Relic in Quest Mode. Ice Storm - Get 100,000 Points in Lightning Mode. Achieve the following goals and you'll be rewarded with Badges. Ante Up - Get 100,000 Points in Poker. Bejeweler - Finish a Classic Game with a Get over 50,000. Blaster - Destroy 30 Gems in a single move. Butterfly Bonanza - Collect 4 Butterflies in 1 Move. Butterfly Monarch - Get 100,000 Points in Butterflies. Chromatic - Clear 25 Hypercubes. Diamond, Mine - Get 100,000 Points in Diamond Mine. Final Frenzy - Get 20,000 Points During a Last Hurah in Lightning Mode. Glacial Explore - Get 100,000 Points in Ice Storm. High Voltage - Get 100,000 Points in Lightning Mode. Ice Breaker - Get a x5 Column Combo in Ice Storm. Inferno - Clear 50 Flame Gems. Relic Hunter - Collect 5 Artifacts in Diamond Mine. Stellar - Clear 25 Star Gems. The Gambler - Get 10 Flushes in Poker. Ante Up - Get 300,000 Points in Poker. 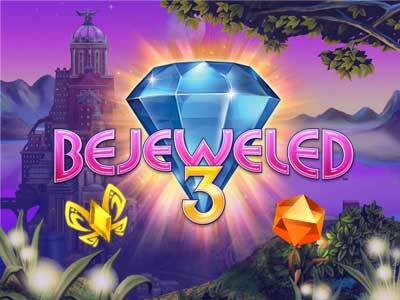 Bejeweler - Finish a Classic Game with a Get over 150,000. Blaster - Destroy 40 Gems in a single move. Butterfly Bonanza - Collect 6 Butterflies in 1 Move. Butterfly Monarch - Get 300,000 Points in Butterflies. Chromatic - Clear 125 Hypercubes. Diamond, Mine - Get 300,000 Points in Diamond Mine. Final Frenzy - Get over 30,000 Points During a Last Hurah in Lightning Mode. Glacial Explore - Get 300,000 Points in Ice Storm. High Voltage - Get over 300,000 Points in Lightning Mode. Ice Breaker - Get a x8 Column Combo in Ice Storm. Inferno - Clear 350 Flame Gems. Relic Hunter - Collect 8 Artifacts in Diamond Mine. Stellar - Clear 125 Star Gems. The Gambler - Get 20 Flushes in Poker. want to edit to desktop. Edit it to say whatever you want and save it. Copy it back, and confirm the overwrite.